Investigating Pain Management In Sports We want to hear from you. What do you want us to investigate about pain management in sports and opioid use? Tell us your questions. 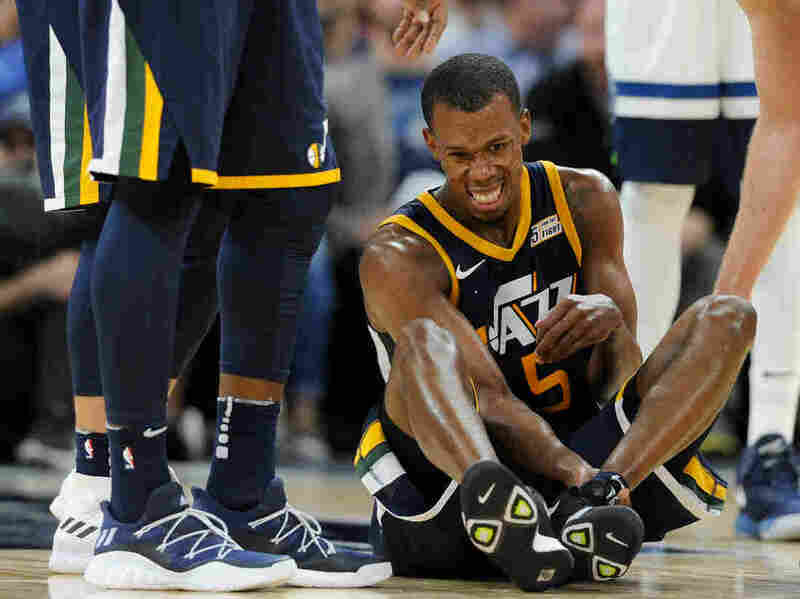 Utah Jazz player Rodney Hood injured his ankle during a game against the Minnesota Timberwolves earlier this year. Pain management in sports sometimes involves medications and their attendant risks. We praise athletes, at every level, for their ability to compete, to dazzle, to perform under pressure, to inspire and — maybe most importantly — to win. And when they fall down, when they tear, break or injure themselves, they promise to pick themselves back up, come back stronger than ever and carry their team to victory — thus solidifying their seemingly superhuman performance. But what goes into recovery? How do athletes get better? And then how do they stay healthy? Often, recovery — and general pain management in sports — involves medication. On game day, many NFL players find themselves lining up to receive a shot of Toradol, Bleacher Report reported earlier this year. Toradol, or ketorolac, is described as a stronger and faster-acting version of Advil or Aleve. One player told Bleacher Report that he had received a shot of Toradol before every game for the past "four or five years." Persistent use of such medication could have long term effects, and it's not just a problem in professional sports. In 2013, a University of Michigan researcher found that "male adolescent athletes who participated in competitive sports across the three-year study period had two times greater odds of being prescribed painkillers during the past year and had four times greater odds of medically misusing painkillers (i.e., using them to get high and using them too much) when compared to males who did not participate in competitive sports." The researcher also found that by the time high school athletes became seniors, approximately 11 percent had used narcotic pain relievers such as OxyContin or Vicodin for nonmedical purposes. So, where does that leave us? We want to hear from you. What do you want NPR's Morning Edition to investigate about pain management in sports and opioid use? Here's how this works: Tell us your question by submitting it below. Our team at Morning Edition will go through responses and pick one — or potentially a few — to investigate further. Your question could be the central topic in a future sports segment on Morning Edition.